The first trailer for The Diary of a Teenage Girl has been released – and the film looks great! Kristen Wiig stars as Charlotte, the mother of Minnie Goetze, a teenager growing up in 1970’s-era San Francisco. Searching for direction in life, Minnie chronicles her daily trials through expressive drawings and painfully honest missives confided to a tape recorder. But when an evening alone with her mother’s opportunistic boyfriend becomes intimate, Minnie is confronted with her burgeoning sexuality for the first time, beginning an affair that casts her in way over her head. 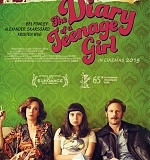 The Diary of a Teenage Girl received rave reviews when it premiered at the Sundance Film Festival earlier this year, and is scheduled for a limited release of August 7. The trailer, high-definition screen captures, first poster, a pic from behind the scenes have all been added to the site. Enjoy!